Last weekend, I attended the International Sketchnote Camp 2018, in which I met Conni a coach from Germany. Conni uses sketchnoting as part of her coaching practice. 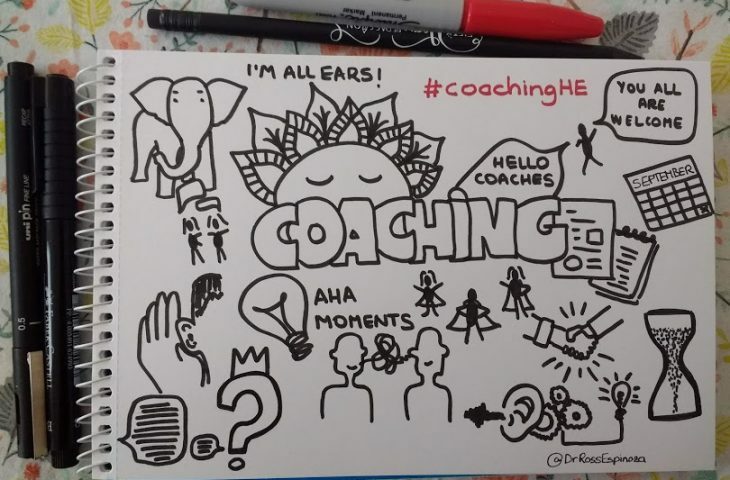 She engages in two main streams of work, supporting female academics who are transitioning jobs and providing workshops to coaches, counsellors and therapists in the use of sketchnoting in their practice. In my own coaching practice, whilst training to qualify as a coach I made use of drawings to take notes, interpret and engage in conversations with clients. As I shared those with my clients, they said they found them useful to make sense of their own experiences and narratives. This contrasts with what Conni and others may do, as for me this was a personal practice. A well-know quote by Einstein goes like this ‘creativity is intelligence having fun’. Creativity has become this intriguing and desirable skill all organisations aspire to have, but don’t create the environment to nurture. Creativity has two relatives: Imagination (her poor cousin) and innovation (her rich aunt). Creativity and Innovation wouldn’t be well-recognised without the input of Imagination. Innovation needs creativity to take off the ground. According to Cambridge dictionary, creativity is defined as “the ability to produce original and unusual ideas, or to make something new or imaginative”. In her book, Angela argues that coaching is meant to support clients to free themselves from their own circular thinking or ‘issues’ by attempting to create original and unusual ideas.